The gate keepers of Sunny Slope. Our 35-acre ecologically regenerative urban farm is also a CSA Program (Community Supported Agriculture.) Our certified organic vegetables support 160 CSA members, The Boise Farmers Market, the Boise Co-op, Idaho’s Bounty and local restaurants. At its heart, Peaceful Belly is a small family farm. We believe in genetic diversity, both domestic and wild. We grow over 180 types of vegetables, fruits, herbs, flowers, and berries. Our food is grown organically and is certified organic by the State of Idaho. We can’t do what we do without our community. It takes community support to produce veggies the way that Peaceful Belly does. We work hard to connect consumers with the people who produce their food. We strive to help create a better community not only with what we produce but also through our educational and outreach programs and partnerships. Our goal is to ensure that our food can be enjoyed by all social classes. In our ten years of farming we have learned so much. First and foremost is the importance of good stewardship for our soil, environment, water, and our health. By continuously growing and expanding our farm we not only produce more food but we become better farmers. Our acreage gives us room to incorporate large crop rotation, and allows areas of the farm to rest. We believe in the importance of raising food with love and care. 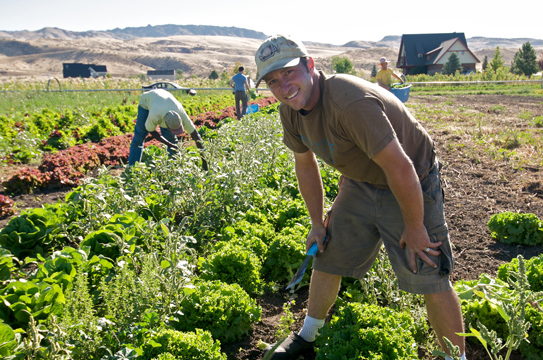 Our entire farm staff functions as a family and we all take pride in bringing sustainable, healthy food to your table. We would love for you to become a part of our family and boast about your Peaceful Belly.